Check out all the details for the gun reform rally. 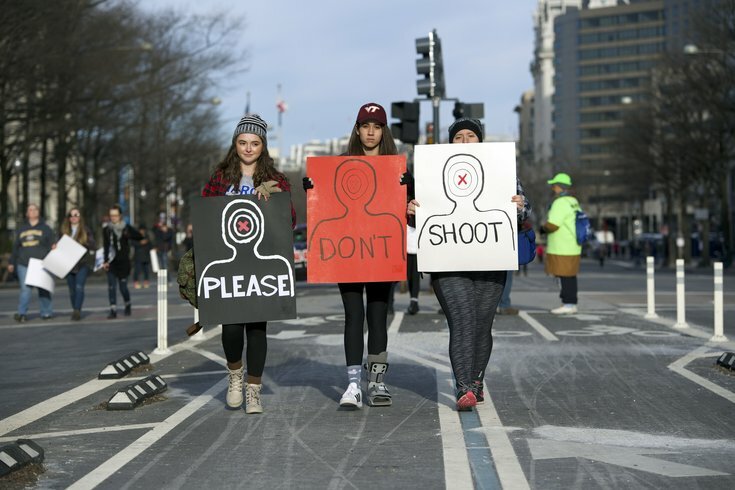 Susanna Getis, Leyla Kolbai and Jillian Donahue of Leesburg, VA, arrive at the "March for our Lives" for gun control protest in Washington, D.C. The Philadelphia location of March for Our Lives, the national gun control rally engineered by teen activists in the wake of the Parkland shooting last month, kicks off Saturday morning in Old City. Scheduled to begin between 9:30 and 10:00 a.m., people interested in attending have a few choices on getting there, including a bonus gift from rideshare app Lyft. In support of the students at Marjory Stoneman Douglas High School, Lyft is offering free rides to passengers attending one of the march’s 50 locations nationwide for rides up to $15. If you’re attending, all you need is the Philadelphia passcode (which is MFOLPHI) when requesting a ride. Check out the full list of codes and more details on the Lyft blog. The Philadelphia demonstration is expected to draw thousands of participants, with more than 10,000 people showing interest on the event’s Facebook page. The march itself will commence at 5th and Market Streets and work its way to Front Street. Marchers will then head south to Dock Street, then east to Columbus Boulevard. The march will end at Lombard Circle around 11:30, where the rally is expected to begin and last until around 2 p.m.
For drivers, take note of road closures outlined by the City of Philadelphia, as well as parking limitations. SEPTA is slated to run on a standard Saturday schedule (save for any typical SEPTA-esque delays), though buses traveling through the march route will be detoured. Be sure to check the event's Twitter account for updates throughout the day if you plan to join.